Phishing emails directed at Amazon users are a rarity. We don’t see many per month, let alone per day. Today we received our first for May. It’s not a spectacular effort, but it is arriving in large volumes. This means it is a specific campaign. In common with phishing campaigns, the opening salvoes are intense. Sporadic emails then appear for the next 2-3 days, before the campaign peters out. Sometimes we see campaigns using similar themed emails start up again weeks or months later. We doubt this is one such campaign. The phishing email is basic. The email warns the recipient that their Amazon account has been restricted. Clicking on a link in the email will resolve the issue. It’s not a genuine email from Amazon. It is a fake. We have reproduced the email in Figure A. It is a nondescript effort. At any rate, there is not Amazon branding. No Amazon logo either. The email is from “Amazon” although the domain name is the National Australia Bank domain. The subject line of the email is “Please update your account information”. A single link has the anchor text “Click here to proceed to account verification”. The email greeting is “Dear Customer”. The email signs off with “Online Customer Support”. 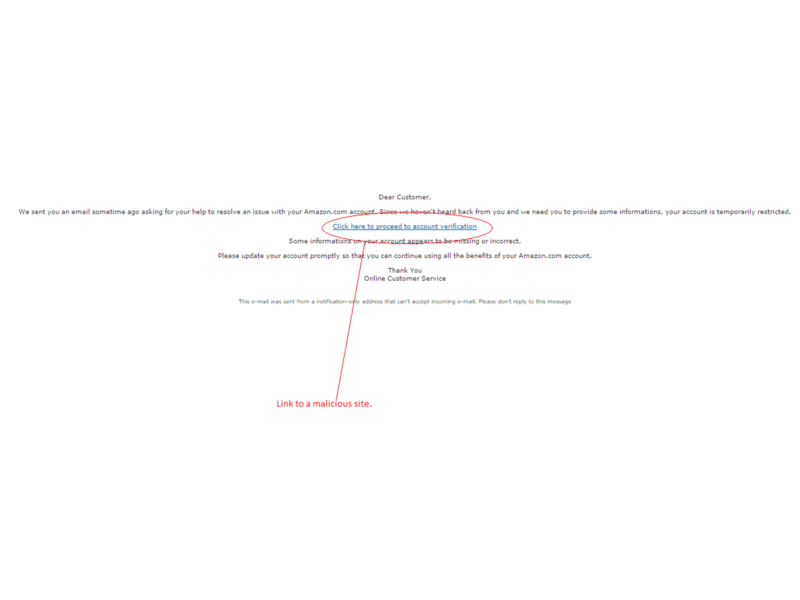 There is a single line at the foot of the email, stating that you cannot reply to the email. This is standard on most corporate emails, and is the most authentic part of the email. The email is bogus, as most people would know. The absence of any Amazon logos or branding is suspicious in itself. The generic greeting heightens suspicions. And if you check the link, you’ll find it does not lead to Amazon. It leads to a phishing site. The phishing site steals customer’s details such as credit card numbers and personal information. This email is not genuine, it is a phishing email. Delete it.